After about 6 years of great hosting by EC Athletics, we have changed locations. We wish Lee Ward great success in his future endeavors. Thanks for all you have done for us, Lee. 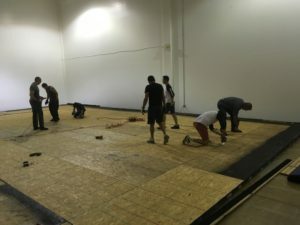 So this weekend, we had our last classes at the “old” dojo, then moved our practice floor and the rest of the dojo to our new location at Texas Champion Gymnastics. Our last adult Class at EC Athletics. Last kids class at EC Athletics. While testing is not the main focus of our dojo, or Aikido, it is always nice when people pass their rank tests. 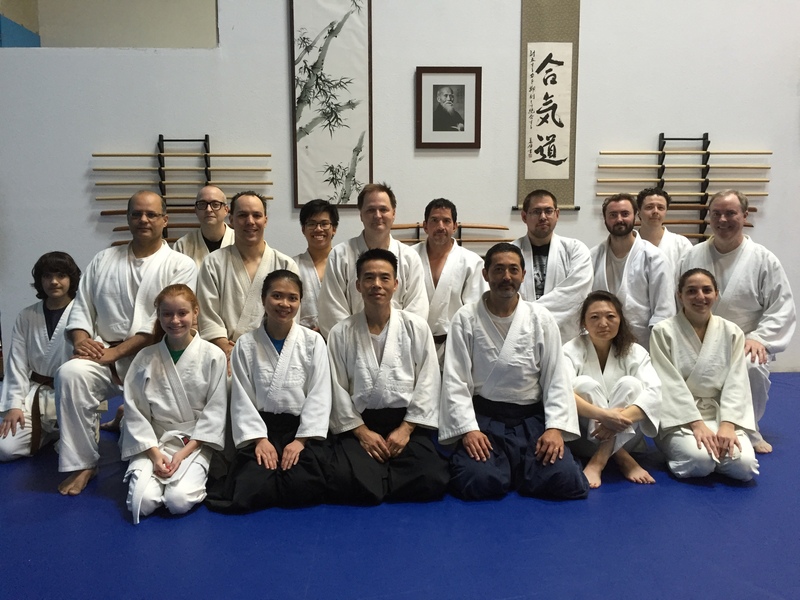 It’s a nice time from students to see where they are on their Aikido journey, and usually the preparation for the exam improves their practice a lot. 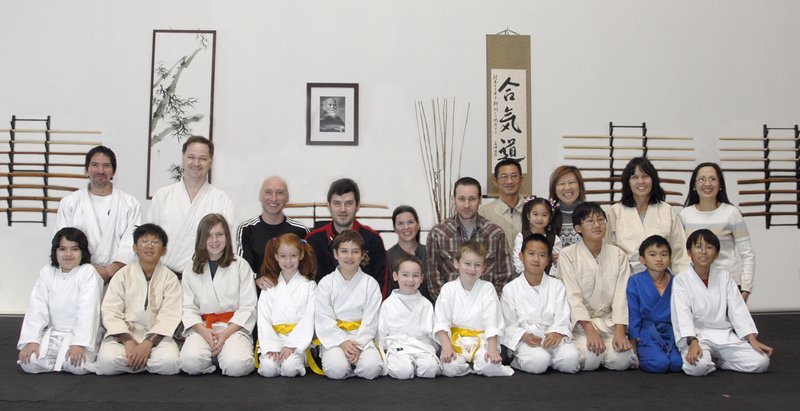 In March 2013 we had three students take and pass their 5th kyu test, which is great! So congratulations to Robert, Minh, and Abu. 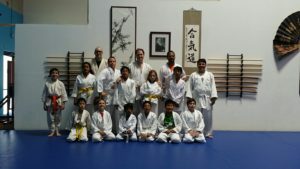 Also, in April, Damon passed his 4th kyu test. We are very proud of him! Everyone just keep practicing. It’s all about the practice. We are currently running a new adult member special. $150 for first three-months, including your gi (practice uniform — normally $50). Included in this is a free Plano Aikido Center tshirt, while supplies last. On Dec. 10, 2011, we had our holiday season party, and took the opportunity to get some group photos. It is hard to get every together during the holidays, and the pics are missing over half our adult members, but most of the kids are there. I guess we need to take group shots at different times during the year to get the full dojo represented. Anyway, it was a fun party. Everyone brought their families and lots of food. Yum! Our kids class, their instructors, and their parents at our 2011 Holiday Season Party. 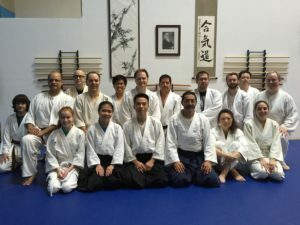 Well fellow aikidoists, it’s been a long, hot summer, and it looks like we have a few more weeks to go. Luckily the dojo has AC and of course some big fans, so we’ve had some great practices. 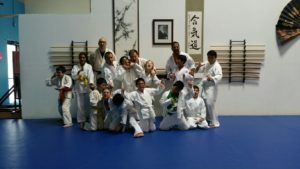 Over the last few month’s Plano Aikido Center has gained quite a few new students, which is great. The Saturday kids class is going well, with all the students progressing nicely. Let’s keep up the great momentum. If you haven’t been to practice for a while c’mon back and get thrown around! Finally, congratulations of David Rush, who passed his 2nd kyu test today, and Pawel Kijowski, who passed his 3rd kyu test. We have a lot of brown belts now, with more on the way. As always, thanks to Shiba Sensei, Shawn, and Mark, for the excellent and patient instruction. The holiday season is again upon us. It has been a pleasure to practice with you all. Many of you will have new resolutions for 2011 and hope Aikido will continue to be one of them. Note that Plano Aikido class schedule will adapt to the season spirit. There will be no class on Fri/Sat Dec 24-25 as well as Fri/Sat Dec 31/Jan 1. If I don’t see you before I wish you all a Happy Holidays and if you are going out of town just travel safe. The annual Kagami Biraki spring seminar for 2011 will take place Jan. 14-16 at Aikido of Dallas. Plano Aikido Center will therefore not have adult classes on Friday or Saturday, January 14 or 15 so that we may attend the seminar. Shiba Sensei strongly encourage you to attend — it is a fun and energizing experience, and will improve your aikido. This is an excellent time to practice with members of many other dojos, experience the teaching of different Senseis, and be taught directly by Yoshimitsu Yamada Sensei. An entire weekend to immerse yourself in Aikido. Your understanding will increase and technique will improve. Saturday evening: 7:30 pot luck dinner at the dojo. Yamada Sensei will be staying at the Holiday Inn Select (972) 243-3363. Ask for Aikido group rate — $65 and 10% discount on breakfast buffet.